Since HFB5230A automatic block making machine uses multi-shaft rotating and compulsory feeding. It greatly improves the density and intensity of the blocks, also reduces the feeding and molding time. In addition, low frequency vibration in feeding materials, high frequency vibration in molding. It offers optimal structure of vibrating shafts, hence it assures the vibration is distributed uniformly in the range of the vibrating table. So it improves the uniformity and stability of blocks, produces better quality blocks than before when using the same ratio of raw material, and reduces the noise greatly. HFB5230A block machine uses Germany Siemens PLC control system and Siemens Touch Screen. Combine with fault diagnosis system, it offers a dynamic display of the system's status, automatic trouble shooting and warning notice. Mold frame is made with inlaid structure, and the mold is processed via the procedures of carburizing, nitriding and quenching. So its service life can be up to 120,000 times production. On both sides of mold, we add 3 aseismic bags for each side. They can reduce the impact force, protect the mold and oil cylinder in molding process greatly. Add 2pcs of guiding shaft and one adjusting wheel on each side, so it is easy and more faster to adjust the material feeder height. 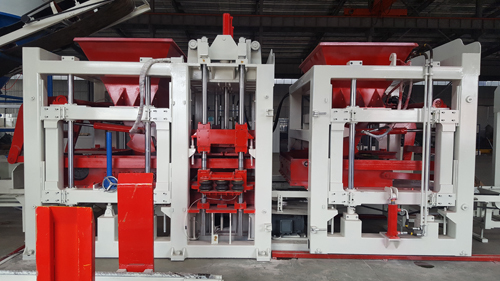 Regarding to material feeding system, bigger and solid swing feeding arm replaced hollow one, two motors changed to one bigger motor, since one force is more concentrated and synchronous than two.